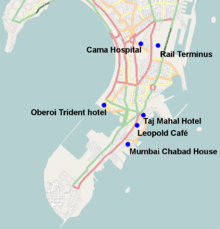 ^ TERROR TAKES OVER MUMBAI Archived 2009年10月22日, at the Wayback Machine.. The Statesman. ^ a b c Who could be behind the Mumbai attacks? Reported 27 November 2008. Retrieved 27 November 2008.